Orient Watch is one of the largest mechanical watch production company in the world, which produces over 2 millions timepieces annually. Orient Watch is a Japanese watch company which established in 1950, and has since offered a wide range of watch designs and styles, including mechanical, automatic, quartz, and light powered, at various pricing level. Orient Star and Orient Star Royal are the middle and high-end brands, with the Royal Orient being Orient Watch flagship model. Unlike other watch brands such as Casio who have focuses on large United States market since years ago, Orient Watch has been primarily focuses on, and has been extremely popular in Japan, and other countries such as Russia, Asia Pacific, Middle East and South America. Although Orient Watch can be considered to be a late entrant into lucrative US market, it does not diminish the quality and value of watches produced by Orient Watch. Though large scale manufacturing (as said before, Orient Watch is largest mechanical watch producer in Japan), Orient Watch manages to offer better value in their watches at the same price range in the industry. Those who wants a piece of Orient Watch but haven’t yet have a chance to own one, now is the chance, not only to get an exclusive model of Orient Watch, but also get the automatic watch for free. Yes, free of charge, no cost, no payment. PRIZE: My Digital Life is giving away an Orient Watch to a lucky reader. 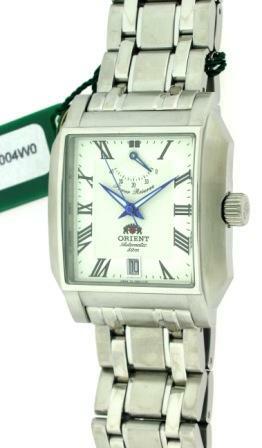 The Orient Watch to giveaway is Tank model (model number # CFDAC004W0). The feature of the watch includes water resistant 50m (up to 50 meters in depth), which make the Tank watch suitable for water related work and fishing. The Tank watch is fully-automatic (self-winding) mechanical watch and equipped with Orient’s popular Power Reserve Indicator, which shows the remaining power in unit of hours when the watch is left idle or stationery. The Tank watch is fueled by motion while worn to wind the mainspring automatically. The Orient Watch Tank is valued at over $200, and will not be available in stores. CONTEST CLOSED. Winner will be announced before or on January 20th, 2009 January 30th, 2009 (delay to allow prize sponsor to select winner). I love watches and Orient is one among them. I can never afford such a watch myself. I’m happy that MyDigitalLife is giving away such a great prize to its readers. As far as I know, Orient watches are very much reliable and long-lasting. This particular watch has great looks to wear on. Its elegant, stylish and what not! I’ve always dreamed to own such a watch. Hope My Digital Life will fulfill my dreams..
HOW TO WIN: To get a chance to win the exclusive Orient Watch timepiece, what you need to do is simply post a reason of why you should get the watch or why you love the Orient Watch at the comment section. The entry can be of any length. The best entry will get the watch. In the case of multiple good entries have been submitted, a lucky draw will be conducted to select the prize winner among the qualified and selected entries. CLOSING DATE: All entry (comment) must be posted before or on 23:59 PM January 15, 2009 according to time stamp that appears on the every comment posted. The timestamp is based on GMT + 8. DISCOUNT COUPON: 15% off coupon code for all new ShopNBC customers to purchase Orient Watch. The coupon expires in August 2009. Simply use the code 8508 during checkout. More information on the automatic watches by Orient Watch USA, or check out and buy Orient Watch products on Amazon.com or Orient Watch products on Watches store at ShopNBC , two authorized dealers in USA.